Well, we have to say that Salt Lake City has taken us by surprise. We’ve enjoyed our visit here a lot. It’s a lovely city, well laid out and very clean. 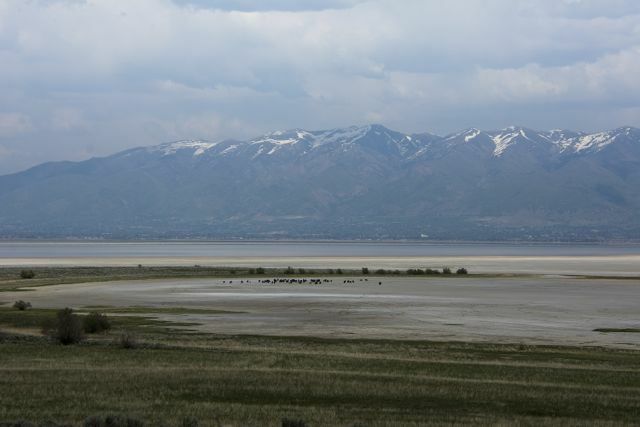 We started the day by visiting the Saltair. 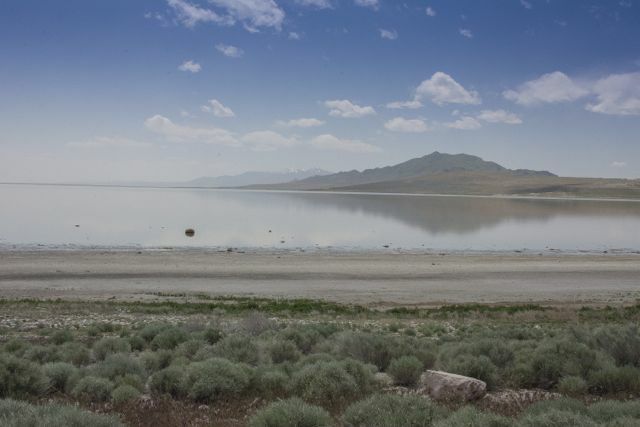 First built in 1893, it is now a concert venue situated right on the edge of the Great Salt Lake. It sits all alone with nothing surrounding it. 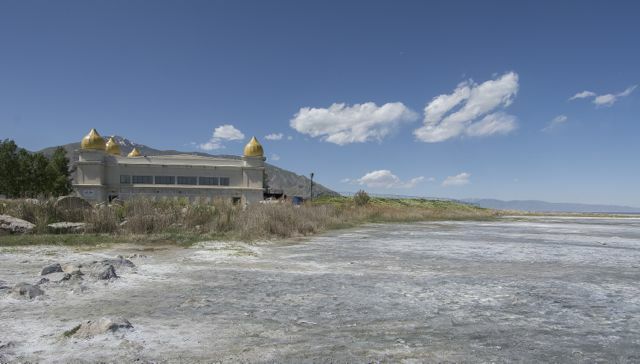 In its heyday, at the turn of the century, trainloads of pleasure seekers arrived regularly at Saltair to sit or lie down, relax and float in the waters just like a cork because it was impossible to sink as it was so buoyant due to the high levels of salt in the water. Even now, thousands of people flock to the Lake to enjoy the experience. No swimming skills are necessary to enjoy the Lake, you just float. 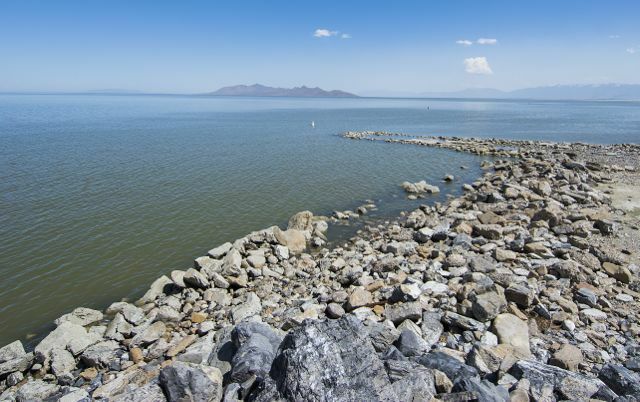 The Lake has been created due to the influx of water from three different rivers. With no exit point it means the water just evaporates leaving salt behind. The ratio of salt in the sea is three percent whereas in the Great Salt Lake it is thirty percent. 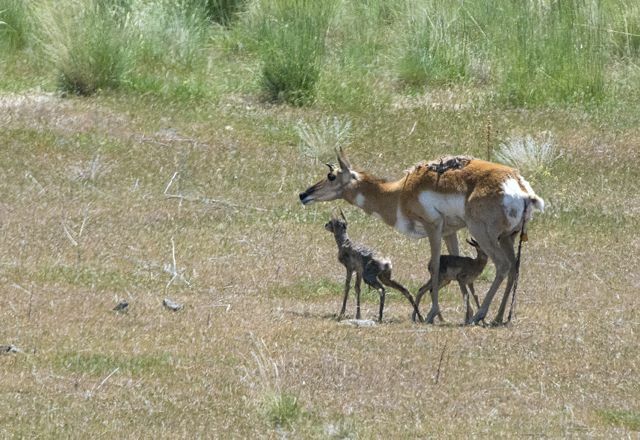 pronghorn antelope who had just given birth to two babies! 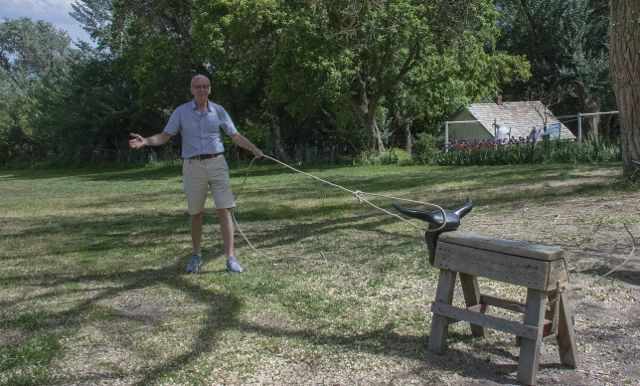 Artifacts reveal prehistoric people inhabited the island more than 6,000 years ago with John C. Fremont and Kit Carson making the first known Anglo Exploration of the Island in 1845.
managing to get his lasso round one of the ‘cows’ horns! 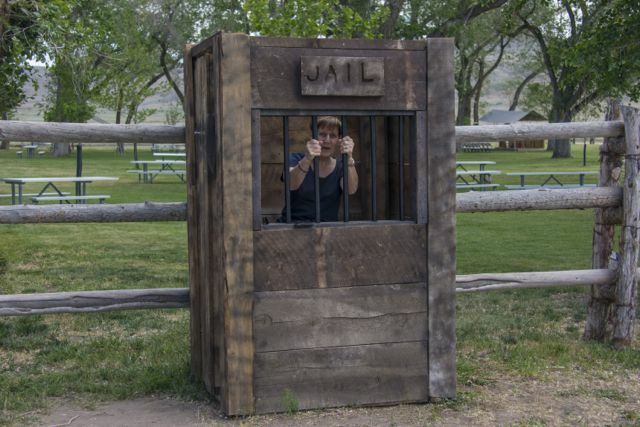 All I got for my failed attempts was a stint in the jail! On our way to the Great Salt Lake this morning we found ourselves in Syracuse!! Well, how could this be, had we taken a wrong turn because we know that Syracuse is in the northern part of New York State? Well, you learn something every day and we now know that there are two towns called Syracuse in the U.S. Note to my good friend Dot: make sure you take the right road or you could find yourself in Syracuse, Utah!!!! 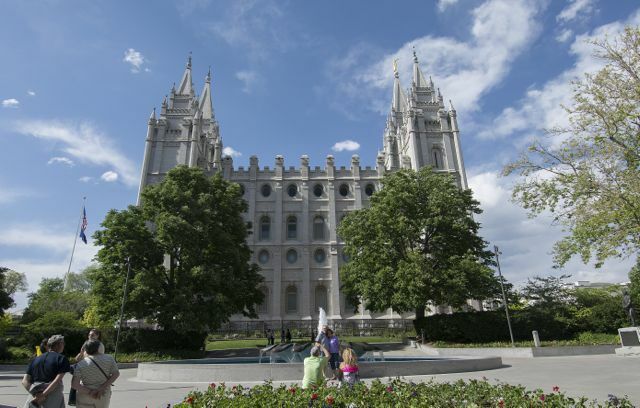 No visit to Salt Lake City would be complete without a visit to Temple Square, home of the Morman Church. The buildings are magnificent. Tomorrow we travel to Yellowstone National Park and unfortunately, they don’t have the internet there so we will be out of contact with the rest of the human race until the 27th of May when we will, once again, regale you of all the great things we will have seen and the wonderful pictures Simon will have taken! Well he hopes! As we are visiting Yellowstone earlier than last year, we are hoping for lots of different photos. It will be much colder and there may even be a touch of snow!! Hi S and S. Not you 2 again away on more holidays. Life is just one long holiday I recon. Glad you’re having a great time, your photographs are always superb and the commentary is such an easy read. Take care and enjoy the rest of your stay. Bill. Thanks Bill. Lots more to come. on your travels again! The pictures capture beautiful scenery. How long are you away for this time? I look forward to hearing about your road trip as you prepress with your travels. I’m off sick at present after a hand operation so I’ll be looking out for your updates. Hi Malcolm, I’m just catching up with comments. You poseur!! I hope you had a great time in Switzerland. For goodness sake Simon, put a hat on man. Good to see the blog has been resurrected. Remember, fewer pictures of Simon’s legs (for the sake of humanity) and more pictures of the grub/booze eh? Have fun and think of us folks in the rain, working to fund your pensions…! Hi Steve, thanks. Yes, I told Simon that exact thing, ‘get a hat on’ but will he listen to me, no!! Will get working on the photos of grub/booze! Thank you for your contribution to our holiday fund, they are greatly appreciated. Hi, It was great to hear from you both and glad that you are enjoying yourselves on your new adventures.. We love the photographs and write up. Look forward to the next instalment. Hey Mr. and Mrs. Barrett! At least your sat-nav was on the right road in the right state!! Awww, Si you also capture the right photos…I love the Momma deer and her newborn. They look a bit scrawny, though! And your blog started with Day 4 for me too…don’t know what happened to days 1-3! Hi Dot, don’t know what happened to days 1-3 either. They are showing as published!